SHORT ANSWER: To save money, to get outside, to eat wholesome foods, to connect with my tiny piece of Earth, to get the kids involved! Click here for my "Today in the Garden" posts if you want to see some of the updates I've made...lots of fun and sunny pics (and some disasters, too!). To me, gardening used to seem old-fashioned, dull, and just...dirty! I grew up with my parents' huge garden in the back yard (oh how I hated those long summer afternoons of weeding! Torture!) Then there were the endless hours of shelling, slicing, husking, pitting, and filling bags (mom was mostly into freezing, so I was spared the hot hours of canning. Though now I wish I'd had the experience). Never during my adult life did I urgently want to grow my own garden. But something changed. A connection was made between my heart, soul, and mind a few years ago that made me need to start a garden. It made sense, suddenly, for me to try to grow as much food as I could. I began to remember my childhood gardens in a different light--and the colors, smells, and downright heavenly tastes of homegrown food began to visit me from those childhood days. I have very little outdoor space (.16 of an acre), so the immediate challenge was to figure out where I'd grow anything--but the challenge spurred me on to read lots of books on that very subject (though I've read dozens of books and I try to review many of them here on my site, the two that got me going in the very beginning were Square Foot Gardening by Mel Bartholomew and Animal, Vegetable, Miracle by Barbara Kingsolver). My grandparents all grew gardens, as that was the norm in those days. My paternal grandparents had more than their extensive gardens; they had fruit trees, bees, chickens, and grandma had an arsenal of preservation techniques tucked away in her brain. I remember the warm, wonderful afternoons I spent with Grandma (she lived just down the road, in the farmhouse). So often I wish that I could talk to her now, go out and collect eggs with her again, watch her as she kneaded bread. Grandma's son (my dad's brother and neighbor) still has his huge garden. My parents have let their garden go for lack of time. I still love to consult with Uncle Loren, who has maintained his passion and always has a ton of harvest to share with me. Now I know I will have a garden, no matter how small, for the rest of my life. I'll forever grow veggies, but my dreams also include chickens, bees, fruit trees, flowers, perennials. I plan to fill this tiny place up. 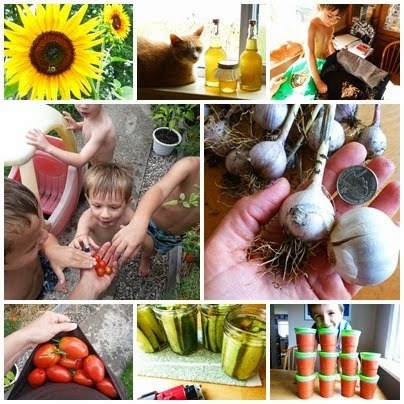 I hope to spread a little of the joy of growing food to my kids and all the other kids in my care (I run a daycare in my home, and gardening projects are a big part of my program now, of course!). Click here to see the very small space that I started with, along with my 3 boys and my amazing daycare kiddos. We've migrated to all kinds of nooks and crannies in the back yard, front yard, and have even (with permission) wandered a bit into the territory of neighbors'. We will keep growing and growing, despite our small space! Come in and learn something new about growing food, right along with me.